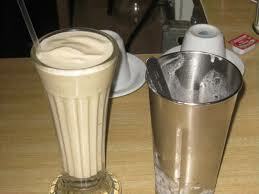 Creamy, delicious banana milkshake reminiscent of the perfect malt-shop milkshakes of days gone by. Straight out of the bottle, tastes absolutely fantastic. The creaminess of the milkshake and the banana flavor mix wonderfully. It doesn't taste like candy banana flavor, either. It tastes just like a real banana milkshake. Great throat hit at 6 mg, and great vapor production on my dripper/mech mod setup. Will definitely keep this stuff in my stash. Tastes just like the banana milkshake from Steak N Shake, not a real banana flavor, but the bright yellow delicious sweet banana flavor followed by sweet cream. I love it alone and mixed with moo juice!!! The best banana-flavored juice I have found to date. It is simply delicious. Prior to this I was mixing two other (read: inferior) brands of cream and banana flavor to try and get something close to this and then I Altcig nailed it. I am once again amazed at how realistic and authentically yummy these are, you'd swear it was made by heavenly dessert angels. Which I guess to me, these guys are :) Haven't found a juice here I haven't liked yet, and that is amazing in itself. Give it a try, especially if you've been disappointed by other inferior vapes in the past. This is it. This is amazing. Reminds me of the banana flavored "Muscle Milk" or the banana Nestle Quik. AWESOME!!! New to vaping and a coworker suggested Altcig to me. Glad she di, as I was unhappy with the flavors that I bought and would have probably gone back to smoking. Started Vaping this today and let me tell you it is the best experience ever. It tastes just like the real thing and the hit is amazing. Thanks Altcig for all that you do. I've been put off by a lot of milkshake vapes in the past, so was kind of hesitant to give yet another one a try. Boy was I glad I decided to not give up because this tastes just like an actual banana milkshake! I'm not a big fan of fruity/ desert flavors but I'm alwasy curios to try to find on I like. This does not taste like a milkshake 100% but it is AMAZING ! IMHO It taste like what others have said, banana pudding, or banana laffy taffy! I agree this tastes more like banana pudding rather a milkshake but banana pudding is my most favorite pudding ever!! This juice is soooo good!!!! Tastes like the jello instant banana pudding I sometimes like to make, but a little sweeter. Wish it was a tad stronger tho. Great vape!! I got this as a 6ml freebie and I LOVE it! It will definately be on my next order! AltCig is the best. I have had terrible luck finding new juices that I really like. That has now changed! Banana Milkshake is a wonderful vape with a nice touch of banana and cream. Not overpowering, but not leaving you wondering what you just inhaled. Great Juice!! What a blast this one is! True banana flavor with that cool creamy ice cream exhale. Heavenly! I found AltCig after reading rave reviews of Banana Milkshake. I'm so happy I did- I will never buy eliquid anywhere else. Premium juice + top notch customer service = one happy customer down in HotLanta! Banana Milkshake is the perfect blend of real banana taste and creamy milkshake goodness! This is in my daily rotation. I'm on my second bottle and have a 3rd one waiting. Yes it's that good! As someone new to the vaping world and not a huge fan of banana flavored items, I tried this flavor because it was sent as a gift when I received my order. I thought I would try it and if I didn't like it I would give it to my brother (who will vape anything). To my surprise, I love, love, love it and immediately ordered more. I can't wait to try the other flavors that I actually ordered but I can't seem to stop vaping the banana milkshake. Banana Milkshake mmm so true to its name. The banana tastes sweet but not overly so, just like real bananas! Perfectly smooth malted milk I love it! I've tried several vendors and Altcig is the only company that I felt compelled to write a review on. Their flavors are amazing! This stuff is INCREDIBLE. I havent tried it by itself, but I added Half 'banana milkshake', and the other half 'pudding cake' and one drop of her 'sweetener enhancer', into a 6ml tank and this is THE BEST juice i have had in my entire year or more of vaping. bar none. I will never buy from another vendor again! There isn't a flavor on here that isn't outstanding. The Banana Milkshake is an all day vape for me. Thank you for such an excellent product and the fastest shipping I've ever seen! i would love to say i'm a fan of this juice but i can't. im a huge banana fan and was truly excited about the banana shake. i tried it a few days after receiving and tasted no banana or cream. Gave it a few days to steep and tried again. Still no banana or cream. All other juices I've tried here were phenemonal and lighting quick service. Not usually a big fan of banana flavored things, but this is just like it looks in the picture. Creamy, fresh banana flavor, and extremely satisfying. I crave it now after a sample, so ordering a big bottle now. Thanks again altcig! I love that they are helping me venture out to experience new flavors. The staff are extremely friendly and they are quick and definitely a good price. Altcig is what I call "top shelf" e-juice.